Welcome to the Wing Chun Kwoon Traditional Wing Chun Academy website! At Wing Chun Kwoon, we teach our students the art of Wing Chun. Made famous by Yip Man, Wing Chun is an excellent fighting system that can be practiced at any age, both male and female. Wing Chun was developed at the Shaolin temple and is based on the most efficient techniques from other fighting styles. Wing Chun Kwoon students study Traditional Wing Chun training methods, theories and fighting strategies from Wing Chun Master Phillip Redmond. Master Redmond is one of two closed-door students of Grandmaster William Cheung in the U.S. He has been training in the Martial arts for over 40 years. In addition to Wing Chun, he has studied Hung Ga, Baat Gua, Bak Mei, Seven-Star Praying Mantis, Juk Lum, Vee-Jitsu te, and Aiki-Jujitsu. Master Redmond became a sifu in Grandmaster Cheung's Traditional Wing Chun system in 1991 and earned his provisional Master rank in 1994. 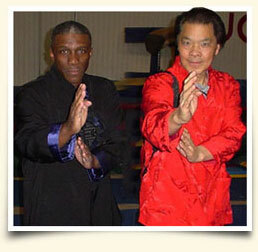 In 1989, Master Redmond started the Yale University Wing Chun Club, where he worked from 1990 to 1994. The most important factor that determines the effectiveness of a martial art is the dedication and commitment of the person training in it. At Wing Chun Kwoon, we will help you develop a strict training regimen in the style that has produced some of the most famous fighters, like Yip Man, Wong Sheung Leung, William Cheung, and Bruce Lee. To view Master Redmond's class schedule, click here.